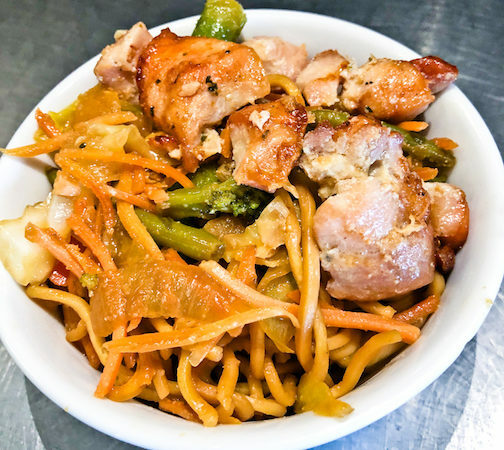 Chow mein noodles in a sesame and tamari sauce mixture with all-natural chicken and assorted mixed vegetables. Vegetarian available upon request. 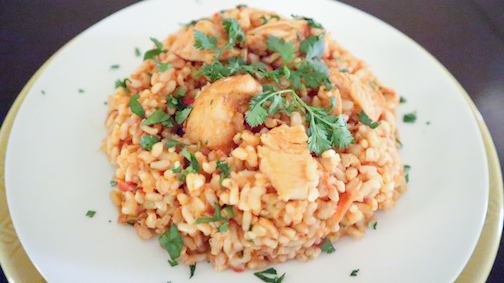 Sauteed chicken, tomatoes, bell peppers, and peas over a bed of seasoned brown rice. 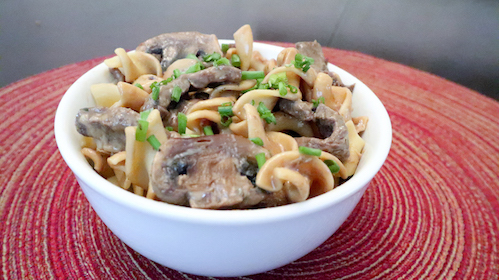 Seasoned beef strips and egg noodles topped with rich, creamy gravy. 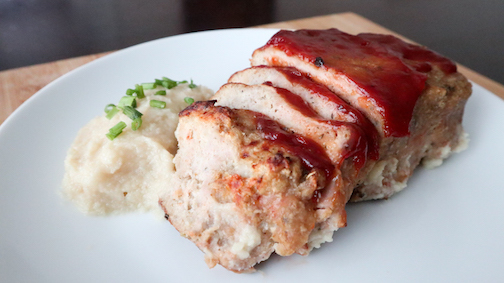 Slices of seasoned ground turkey loaf served with cauliflower mash. 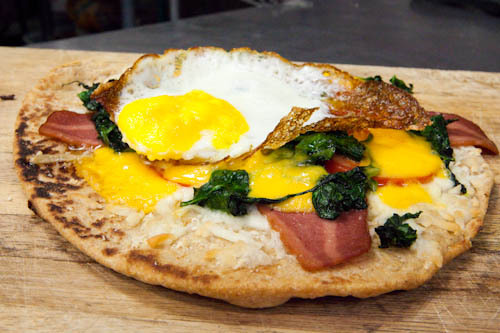 Breakfast on flat bread, oh yeah! Tandoor baked mini Naan flat bread topped with cheddar jack cheese, fresh spinach leaves, tomato slices, turkey bacon, and a fried egg. Want to make it vegetarian? Just ask. 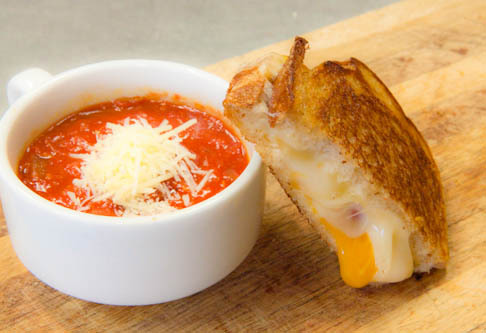 A classic combination of our fresh Homemade Tomato Soup and Grilled Three Cheese Sandwich. 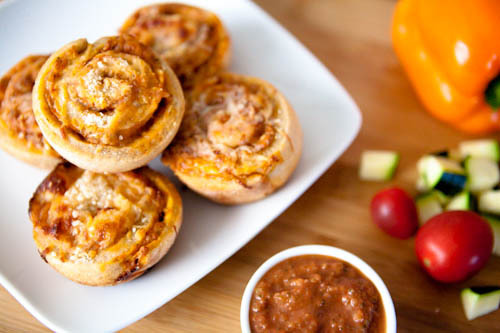 Your kids will love dipping their sandwich into the bowl of sweet, velvety soup. 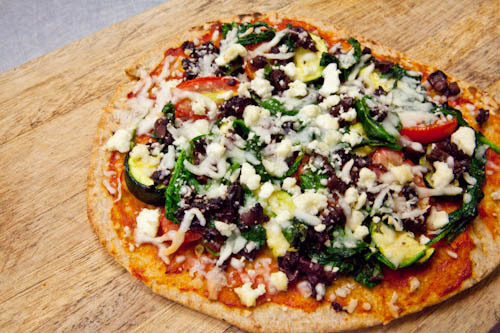 Hearty Tandoor baked mini Naan flat bread topped with a fresh medley of spinach, tomatoes, zucchini, olives, roasted garlic, and red onions topped with feta cheese. 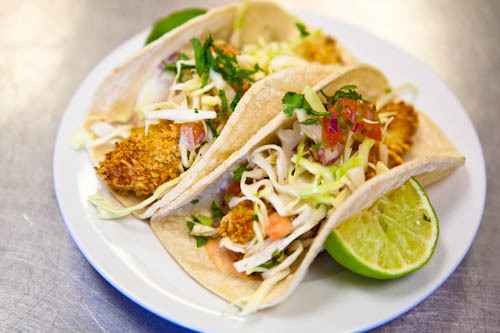 Our hand-breaded crunchy oven baked cod folded in a warm corn tortilla topped with shredded lettuce, pico de gallo, and tangy salsa. 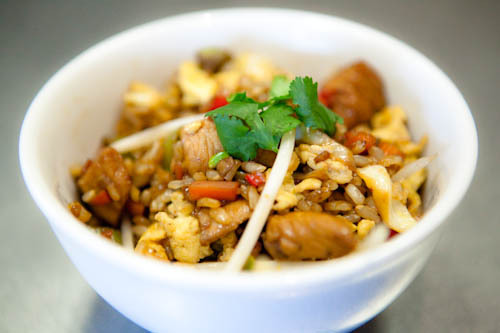 Seasoned brown rice sauteed in a sesame and tamari sauce mixture with all-natural chicken and a fresh and colorful medley of carrots, bean sprouts, snap peas, and spring onions. Gluten-free. Vegetarian available upon request. 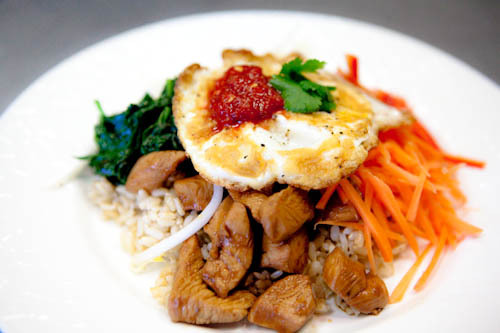 Bibimbap, a signature Korean dish, literally means “mixed rice.” Our healthier version uses warm brown rice topped with a mixture of sauteed and seasoned chicken and vegetables (carrots, spinach, and bean sprouts), gochujang (chili pepper paste), tamari sauce, and then topped with a poached egg. A feast for the eyes, especially after it’s thoroughly mixed together before eating! Our homemade marinara sauce is blended with freshly chopped organic spinach, bell peppers, carrots, mushrooms, onions, tomatoes, and zucchini, spooned on our hand-tossed whole wheat pizza dough, and then layered with fresh mozzarella cheese. Contains at least 60% recommended daily value of vitamins A and B1. 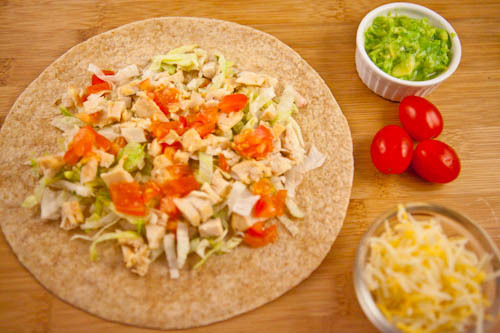 Grilled all-natural chicken topped with shredded lettuce, chopped tomatoes, and shredded low fat monterey jack cheese wrapped in a whole wheat tortilla. Served with a side of freshly prepared guacamole and salsa. A classic favorite! 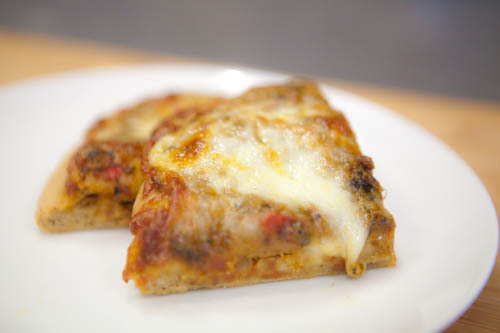 A blend of homemade marinara and freshly chopped organic spinach, organic bell peppers, organic carrots, mushrooms, onions, tomatoes, and zucchini layered between a whole wheat crust, sprinkled with mozzarella cheese, then baked to golden brown. Contains at least 60% recommended daily value of vitamins A and B1. 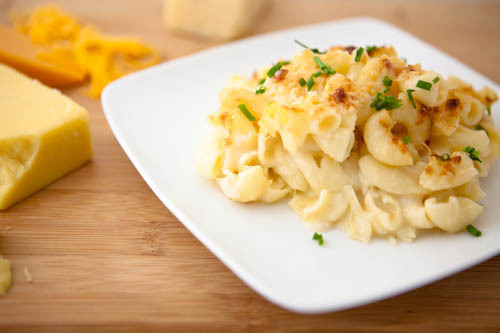 Whole grain macaroni pasta mixed with a blend of 3 low fat cheeses – mozzarella, monterey jack, and parmesan – and oven baked to a golden brown. Sprinkled with freshly chopped parsley or chives. Just plain cheesy! Contains at least 40% recommended daily value of protein and calcium. 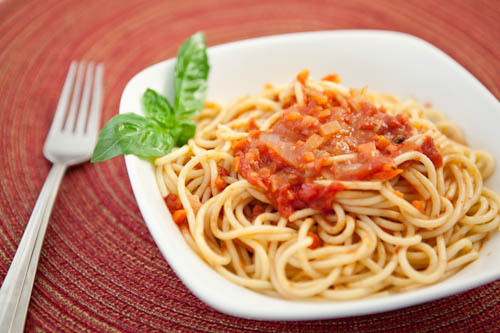 Whole grain spaghetti smothered in fresh homemade marinara sauce. 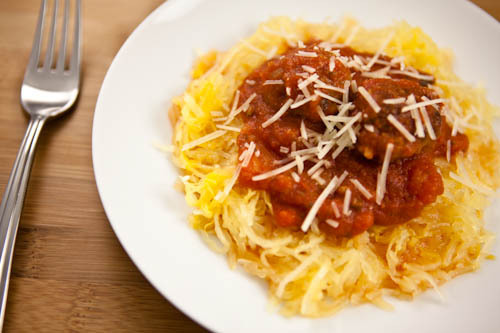 Roasted yellow squash strands seasoned with grated parmesan, smothered in fresh homemade marinara sauce, and topped with homemade beef meatballs. 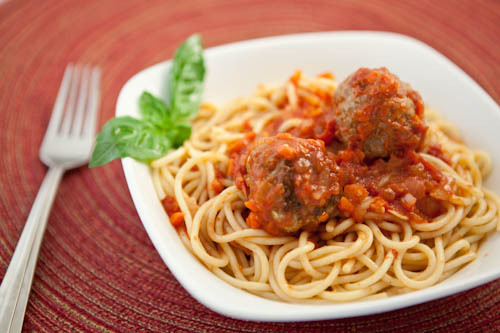 Whole grain spaghetti smothered in fresh homemade marinara sauce and topped with homemade beef meatballs. 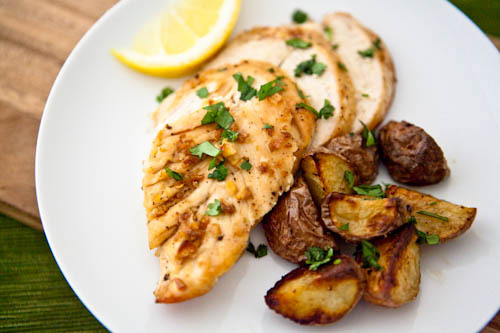 All-natural tender chicken breasts, roasted in a garlic and olive oil mixture, and served with roasted red potatoes. Contains at least 30 grams of protein per serving. 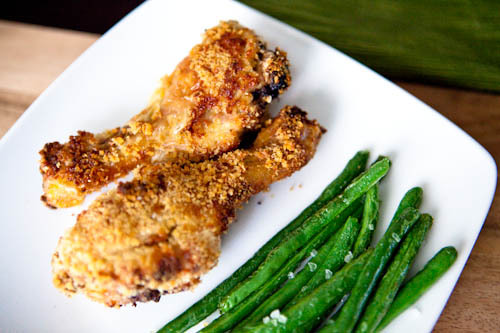 All-natural chicken drumsticks, breaded in Panko, and roasted in the oven to a crispy golden brown. Served with a side of green beans. Contains at least 30 grams of protein per serving. 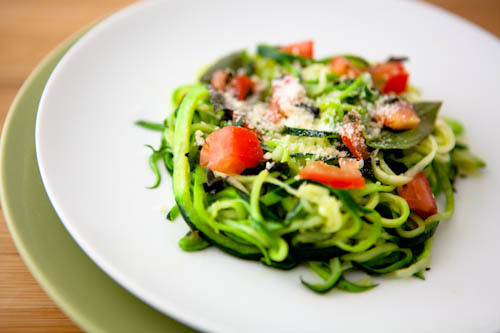 Fresh zucchini, lightly seasoned with salt and grated parmesan, sauteed in extra virgin olive oil then topped with chopped tomatoes and fresh basil. Gluten free. 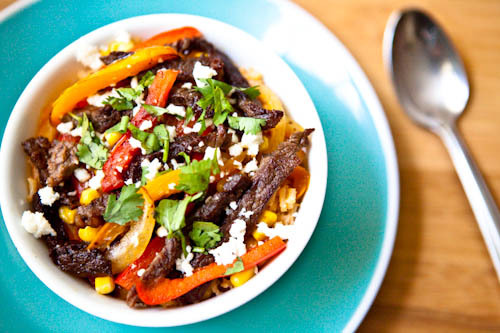 All natural skirt steak grilled and served in a bowl of seasoned brown rice, red onions, bell peppers, corn, and Queso Fresco cheese. Firm and flaky white fish in a seasoned mixture of low fat parmesan and whole grain breadcrumbs, oven baked to a golden brown crunch. 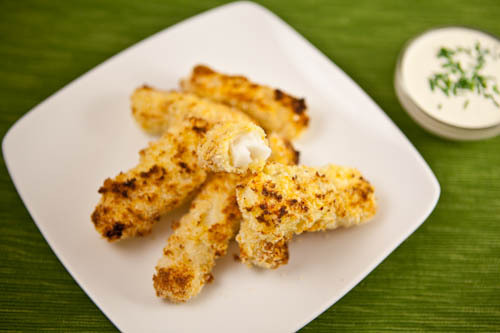 Served with a dipping sauce of fat-free mayo, Greek yogurt, and mustard. 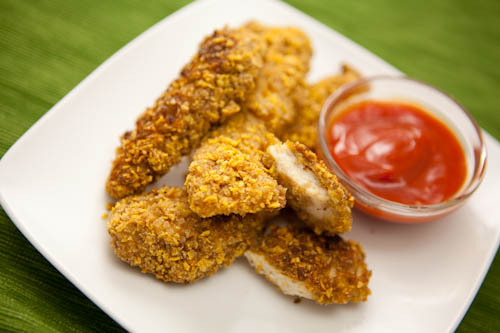 Fresh cut, all natural chicken breast meat and seasoned breading baked to a crunchy goodness. Contains over 50% recommended daily value of protein per serving. 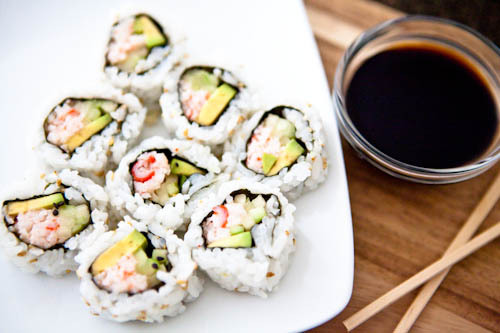 Whole grain sushi rice with surimi, cucumber, and avocado wrapped around lightly seasoned nori. 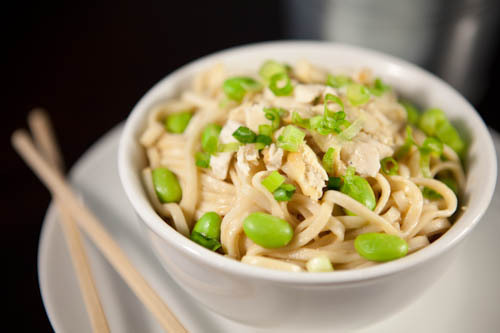 Served with high protein edamame and low sodium soy sauce. 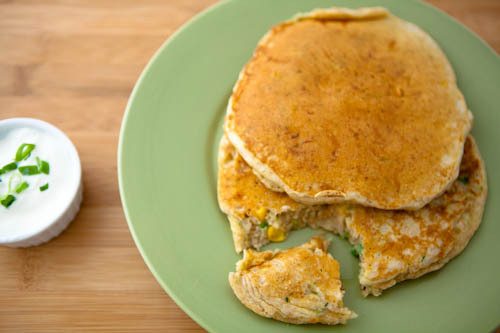 Light, fluffy whole wheat fritters filled with corn, fresh zucchini, parmesan cheese, and scallions. 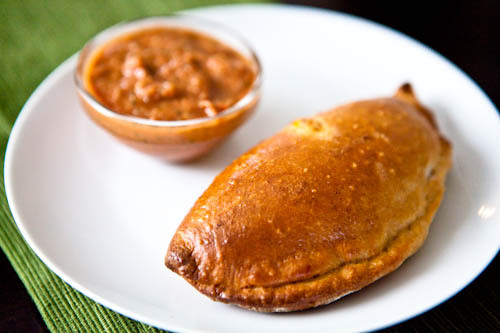 Packed with nonfat Greek yogurt for dipping. 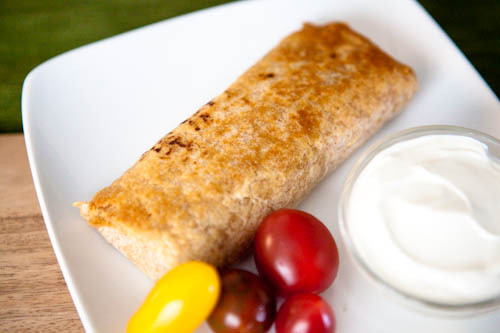 Protein rich beans and jack cheese wrapped in a crispy whole wheat tortilla shell. Served with a side of nonfat sour cream and a serving of ripe cherry tomatoes.